There's nothing sweeter than receiving a hand made present from a special child. 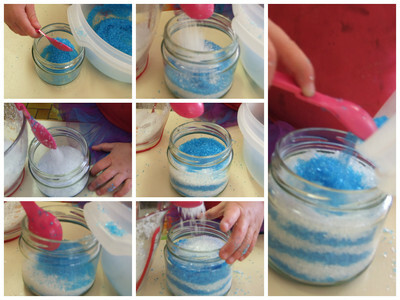 Here is a way for kids to make a matching set of body scrub and bath salts for someone special. Essential Oils - see notes at bottom for ideas. Body Scrub: Put 1 cup of sugar into a bowl. Add 3/8 of a cup of oil. Add around 15 drops of essential oil. Spoon the body scrub into some clean jars and seal. Bath Salts: Put 1 cup of epsom salts into a container. Add a few drops of food colouring to one half and mix until the colour is even. Fill the jars, taking one layer from one bowl and one layer from the other bowl. Seal the jars. You can make pretty tops with a fabric circle and piece of string. Cut some fabric about 2cm larger than the jar. I had some lovely blue gingham, but Michelle said no! Add sticky labels, or tie a tag onto the string. Safety: This activity should be done under supervision - the sugar and oil are safe to eat, but it's not advisable for kids to eat the essential oils (some are safe, some are not). Epsom salts are safe to eat in small amounts, but have a laxative effect. Keep fingers away from mouths and wash them afterwards. Essential oils: For a bath gift, I like either calming or invigorating oils. Calming oils include lavender, rose, chamomile and mandarin. Invigorating oils include any of the citrus oils (lemon, grapefruit, sweet orange) and peppermint. Have a look here for lots of scent ideas.